Exclusive! Let your furry friend curl up next to you without harming the furniture! 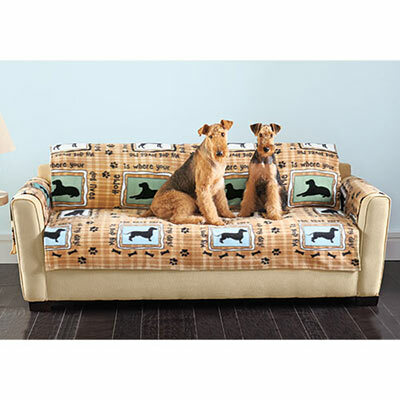 Our Love My Dog Furniture Covers feature pooch and paw print pattern in neutral tones that complement any room. Super-soft polyester fleece with tuck-in styling. Machine wash. Imported. Chair - 24" x 80"
Loveseat - 48" x 80"
Sofa - 70" x 80"
I have purchased the cover for the sofa and the chair and love them both. The fleece is thick enough to protect my furniture and soft enough to be comfortable. I really enjoy the pattern. They wash beautifully.